Dental braces allow teeth straightening and correct arcade positioning. Crooked teeth can be family inherited but can be a consequence of thumb sucking. Teeth can also modify their natural position if a lost tooth wasn’t replaced in time. In this situation the other teeth could have moved in the missing one’s direction causing tooth gap. Because of being embarrassed by your teeth appearance, in time you will tend to smile less often or at all and to cover your mouth to hide them. Orthodontic treatment straightens your teeth so they look better. Your face will look different and your facial muscles will start functioning correctly. This treatment uses dental braces or other instruments which directly press cooked teeth until they reach their right position. In most cases, dental braces components are made of metal and esthetical ones of ceramic. The elastic and metal bands can be colored, colorless or the same shade as the teeth. The dentist or orthodontist can suggest other treatments before applying dental braces. Braces can be mobile or fixed orthodontic braces with either ceramic, metalo-ceramic or metallic brackets. 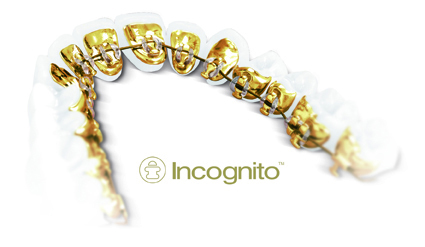 Incognito lingual, invisible dental braces is made of gold and is placed behind teeth so that it can’t be seen. It prevents cavities, the gold is easily tolerated by the body and completely excludes allergies risk. Designed after teeth mould analysis and computer scan. in a unique laboratory in Germany, the braces can be placed only by accredited specialist. It is manufactured in 10 days. City Dent is accredited to perform treatments using Incognito. Even though they are places on the front part of the teeth, the sapphire orthodontic braces is invisible. It represents the esthetic alternative to fix metallic or ceramic braces. Patients prefer it because it is colorless and easy to wear. …are superior to metallic ones both in appearance and biotolerance. Invisalign is the only modern, brackets, metal wires and other components – free orthodontic treatment. Mouth guard can be taken off when needed (at meal time, while brushing teeth). Invisalign is used only in mild abnormalities cases, to correct teeth position. Our dentists can verify if your child has dental problems which imply dental braces. At City Dent you can benefit from interceptive orthodontics. Your child can be checked by our specialists even before turning 7 years, this way offering our orthodontist the possibility to gradually treat problems as they appear and develop. We’re waiting for you to ask our orthodontists for advice. The patient, aged 40 years, has worn a fixed device for 6 months on the lower arch to align the teeth. Superior high due to coronary destruction and large composite fillings with relapse of caries, teeth had to be covered, all-ceramic crowns to obtat offers superior aesthetics.